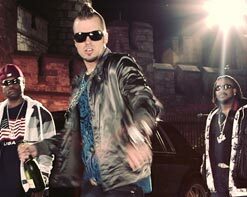 LEL Brothas "Mr. My Way"
The LEL Brothas are an American Hiphop group from Prescott Valley, Arizona. Officially 2 members, the founder DJ Clone and member Nytmare, the LEL Brothas never go far without LEL Step-Brotha and hype man CB5. The LEL Brothas made Hiphop history in 2011 by being the first ever American Hiphop group to perform in a concert in the Kingdom of Saudi Arabia and were named Ambassadors of the American music culture by the USA State Dept. and Ambassador James Smith. The LEL Brothas have headlined in over 11 countries including Saudi Arabia, Bahrain, the UAE, Jordan, Lebanon, Japan, Brazil, Spain, Ireland, England, the USA, and Canada, rocking over 500 stages worldwide! They have had music placements in many television shows and indie films as well as a major placement in the hit video game Rock Band 3 with their hit song “Hatas.” It has been a long and ambitious road for the Brothas that many folks thought they could never navigate, but when everyone else is sitting in their cubicles fighting through the 9-5 they are enjoying the high life in a desert paradise living the life of kings. We are always proud to work with innovative and unique artists, and with their blend of metal and hip-hop the LEL Brothas are exactly what we’re looking for! Please do get in touch to find out more about this amazing group and what we can do to help get the “Mr. My Way” video into your programming! Please contact Andy Gesner and the HIP staff at (732)-613-1779 or email us at info@HIPVideoPromo.com for more info on LEL Brothas.